Buddhism is one of the six recognized religions in Indonesia. That being said, Buddhists are definitely in the minority, making up the smallest percentage of followers. Most Buddhists in Indonesia are Chinese. Before Islam infiltrated Indonesia, many Indonesians followed Buddhism, as they did Hinduism. It is the second oldest religion in Indonesia, arriving in the sixth century because of the trading activity on the silk road between India and Indonesia. There were several Buddhist empires throughout Indonesia in this time period. When Islam entered in the 13th century, Buddhism began to dwindle, and by the 16th century it had replaced Buddhism and Hinduism as the dominant religion. The largest Buddhist temple in the world, Borobudur, is in Central Java. It was built in the ninth century and is an UNESCO World Heritage Site. For the most part Borobudur is now a tourist trap, but it is also used annually for Waisak, the most important Buddhist holiday in Indonesia. On Waisak, thousands of Buddhist monks will gather there to chant and meditate. Today there are several Buddhist schools in Indonesia. Most Indonesians follow the Mahayana school, although there are also Theravada and Nichiren Buddhists. Since 1955, there has been a revival of Theravada Buddhism in Indonesia when a Theravada monk did a tour across Indonesia. The Theravada school actually now has indigenous monks trained in Thailand who go back to Indonesia. Because of Pancasila, a Buddhist monk participates in almost all state-sponsored ceremonies. The Buddhist representative that is usually chosen is a Theravada monk. Although Buddhism is an officially recognized religion, and most Indonesian Muslims are tolerant, there is still persecution. 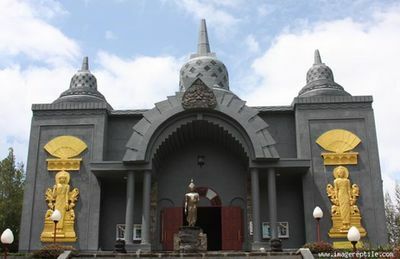 In April 2011, the Ministry of Religious Affairs sided with a municipality in North Sumatra that ordered a Buddhist statue be removed from the roof of a temple. Much of the work in Indonesia is now focused on Muslims, but Buddhists need Jesus just as much! Pray for Buddhists in Indonesia to come to know Christ! Pray for the many Chinese-Indonesians who are Christian to reach out to their Buddhist family members.